Editor’s Note: While I haven’t written on here since the big change in the format, it will be addressed. I have talked about it over on ManaNation, and eventually they will be linked over here. But now is not the time nor the place for that discussion. Ding dong the witch is dead, the witch is dead. Transguild Courior is now only legal in 5 color decks (it also means it’s now a 5 color Pauper Commander). The Kobolds are now Red decks only (if you really wanted to put them in a deck for a combo or something). Apparently color identity doesn’t mean the card is changing colors, but just the overall feel of it. I got a little excited with some of my ideas, but was cooled down by the Twitter crowd. Make note of this people. Putting on my MTGCP Magic designer cap, what this means can be very exciting in the future. If you noticed, there hasn’t been too many Legendary Creatures that have been printed off-color recently. Why? Because they couldn’t be used as Generals/Commanders and a large part of WotC guys play EDH/Commander. Why print something if players couldn’t use them in that format? So, I guarantee that in the future there will be off-color Legends that will be printed. Why? No idea, but that opens up a whole lot of design space to play around in. So, tell all your friends about this change. Knowledge is power. These rules take effect December 20th. 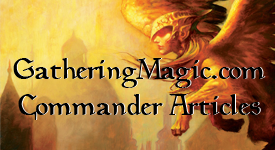 The EDH/Commander Banned List has been updated. This entry was posted on Tuesday, December 14th, 2010 at 12:40 pm	and posted in Commander, EDH, EDH Bannings. You can follow any responses to this entry through the RSS 2.0 feed. Though, i agree that Emrakul is always a pain to play against. It does seem a little over the top to ban… Yes, It’s ridiculous but there are more than enough artifact mass removal spells that anyone can play. Depending on the Meta where ever you are, it easy to adjust to just one card. I as a fellow blogger who wrote about the “Eldrazi Matter” last week, totally agree with you on that…. I believe it is not only about not having enough answers at hand, but rather about the way how much everybody hates to play against him. When there is one DEFINITVE best creature ever that wins you the game, there is not much choice involved when you choos which one creature you want to play in your deck. So as soon as you built a deck where you are going to cheat some extreamly good creature into play, or accelerate to a certain point, allways there is only one ANSWER with Emrakul in the mix. This leads to an environment where oyu have to face him all the time… meaning that everybody will get fed up to seeing him… or loosing against him. and isn’t that the first banning principle in EDH! IT’s all about making the game fun! I think the Emrakul banning is overkill. Several people I play with owned Emrakul. None of them played it, for a very simple reason: Bribery. The blue players would have loved to play against decks packing Emrakul; instead they had to settle for Ulamog or Kozilek. And Bribery is an auto-include in any Blue list anyway, so it didn’t warp the format at all.